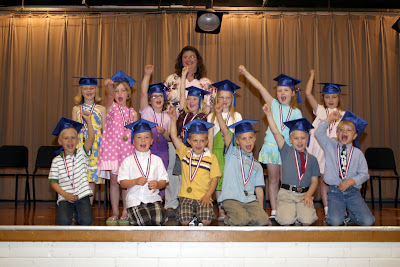 Exeter-Milligan Kindergarten graduates were excited about moving on to first grade. They are pictured in the front row from the left Kole, Alec, Peyton, Brekken, Braden, and Ben. Middle row begins on the left with Olivia, Emma, Becca, Cameran, Alivia, Briana, and Katelyn. Standing behind her students is Kindergarten teacher Judy Kassik. Not pictured Casey. 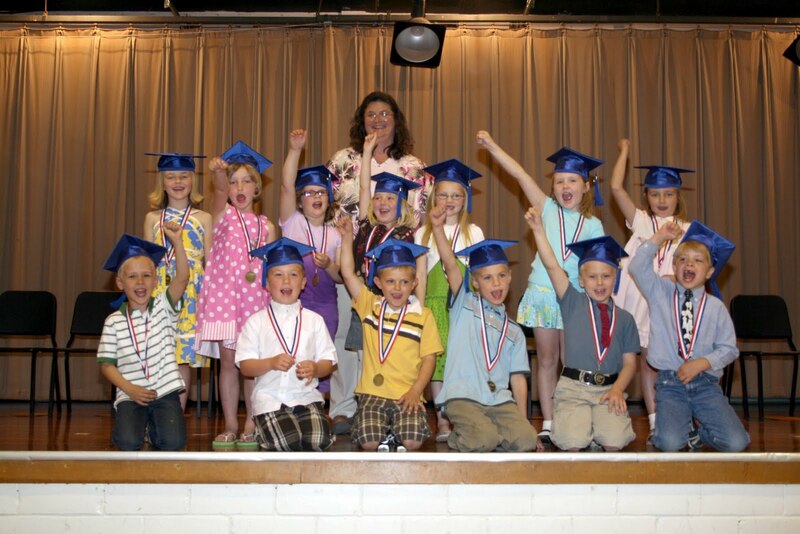 It was all smiles for the Exeter-Milligan Kindergarten class as they graduated from Kindergarten on Wednesday, June 19th. Fourteen students walked in wearing their mortar boards as Pomp and Circumstance was played. They were accompanied by Jordyn Brandt and Meredith Emshoff on the piano. The students performed If You're Happy and You Know It with a modified last verse about moving on to first grade. They also performed From the Inside Out about character. Kindergarten teacher Judy Kassik and Elementary Principal Mari Lyn Poppert presented the students with Kindergarten Diplomas, Book It awards, Field Day ribbons and attendance awards. Parents and family members cheered the students on as they each received special medallions that were purchased by the Exeter-Milligan Booster Club. After the ceremony guests and participants were invited to a cookie and punch reception in the Kindergarten room.